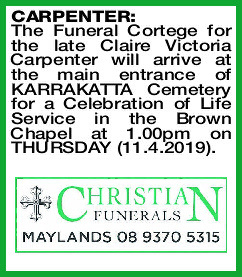 The Funeral Cortege for the late Claire Victoria Carpenter will arrive at the main entrance of KARRAKATTA Cemetery for a Celebration of Life Service in the Brown Chapel at 1.00pm on THURSDAY (11.4.2019). Passed away peacefully on 27 March 2019. Loving wife of Allan (dec), Mum to Col, Bernie, Trev, Judy, Bev and Peter. 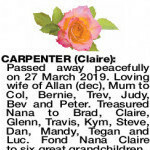 Treasured Nana to Brad, Claire, Glenn, Travis, Kym, Steve, Dan, Mandy, Tegan and Luc. Fond Nana Claire to six great grandchildren. 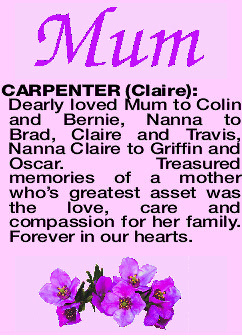 CARPENTER CLAIRE Dearly loved Mum to Colin and Bernie, Nanna to Brad, Claire and Travis, Nanna Claire to Griffin and Oscar. Treasured memories of a mother who's greatest asset was the love, care and compassion for her family. Forever in our hearts. 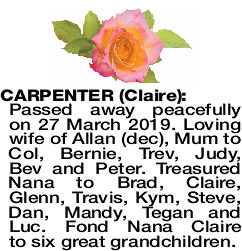 CARPENTER CLAIRE Much loved mother of Bev and Peter, nana to Glenn, Kym and Steve. Nana Claire to Josh and Ben. 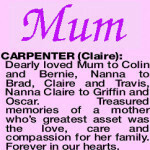 We will miss you so much mum, you'll be forever in our hearts. Breathe easy now. 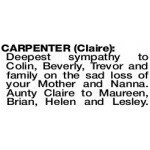 Deepest sympathy to Colin, Beverly, Trevor and family on the sad loss of your Mother and Nanna. Aunty Claire to Maureen, Brian, Helen and Lesley.